Wanna get in touch with me to discuss something I’ve written? A fancy business type who wants me to review one of your products or services? Offended and Angry and want to tell me off? Here’s how to get in touch with me. Follow me on TWITTER! See me tweet way too much! Like me on the FACEBOOK! I post random crappy photoshops as well as adding regular blog updates! Like and subscribe to me on YOUTUBE! I do upload videos more regularly now. I have made 12 cents from monetisation ever. Do something with TUMBLR! I don’t really know what Tumblr is for! Watch me play games on TWITCH! Pew pew pew! See my heavily filtered face on INSTAGRAM! Apparently the big corporate types like folk to have an Instagram, so there you go. I’m on the PSN! See all my trophies and laugh at how pathetic I am! 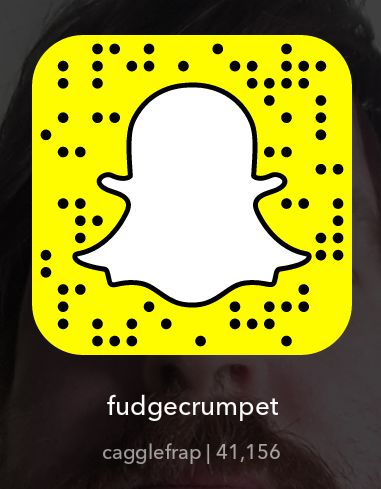 I’m on SNAPCHAT! Send me self-destructing photos of notboobs and cake! So now I’m only one click (maybe 2, or 3. It’s a metaphor really) away from you at all times. I could almost touch you. But I won’t. Not until you’re asleep.